Something that caught my eye last week as I was dipping in and out of rhizo14 was Kevin Hodgson’s (@dogtrax) slam-style poem challenging people to “steal this poem” – to take the words he’d written and recorded, and remix them. This was a riff on the theme of plagiarism, ownership/copyright & remix culture that emerged from the week 1 rhizo14 topic “cheating as learning”. I love his response on so many levels – it’s an awesomely creative and thought provoking exploration of whether taking and remixing someone’s work constitutes as ‘stealing’, beautifully executed. I love the style and I was incredibly intrigued by the questions raised by the poem and his post (which I wrote some initial thoughts on in his blog). I love that he’s inviting (or challenging) people to take his work, explore it, and remix it into something new – it’s a challenge to think and respond more creatively – and, (in DS106 tradition) to create art (dammit!). I love this, and found it very inspiring – and knew I had to do it as soon as I saw it. I was interested in the question of whether remixing constitutes stealing – and saw a lot of parallels between use of the terms ‘stealing’ and ‘cheating’, debated in areas of the rhizo14 community. So this is what I explored in my poem. I was also interested in the idea of executing a literal interpretation of Kevin’s challenge: literally ‘taking the words’, reusing, & remixing them to create a new poem. So I’ve tried to use as many of Kevin’s words as I can in mine. The slam style that Kevin’s adopted is also reminiscent of rap, with a strong internal beat, rhyme, rhythm & flow. It’s a style I love and that I’ve also incorporated in mine. A bit like battle-rapping, on paper. I also wanted to make Kevin’s text visible in my remix, for 2 reasons: to see the crossover between his words and mine; and to explore the question of whether taking and remixing a work without attributing its source constitutes as ‘stealing’ . I’ve copied the full text of his poem into my remix without attributing it. Does this constitute ‘stealing’? You could probably argue that, in principle, it does. But if Kevin’s invited me to ‘steal his poem’, and I’ve stated in my work that it’s a ‘stolen’ work, does this change things? Evan Roth’s work was, I thought, like a modern riff on finger painting…and I loved Maureen’s description of it as ‘visual poetry’. My 3 year old was sitting next to me playing a game on the tablet and it clicked: I should get my kid to make some art as part of the remix –> ‘visual poetry’. I often get him involved in DS106 daily creates, it’s fun to do together. But what…? I had the rhizo learning P2Pu page open in one of my tabs. The image for the course was kinda like…finger painting. Click. I downloaded a kid’s drawing app onto the tablet then gave it to my 3 year old. The background image for my stolen poem is his drawing – a digital (Maureen Crawford-Evan Roth-P2Pu rhizo learning-inspired) ‘finger painting’ (I’ve just put a layer of white at 30% opacity over it to make the text legible). 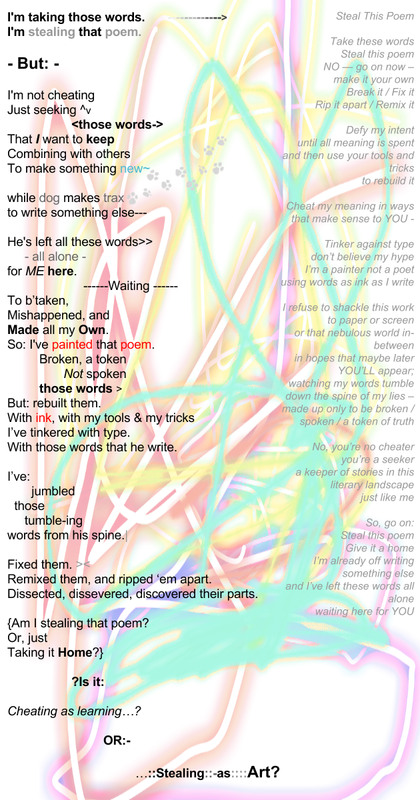 Combined with the poem, it’s another remix on the concept of ‘visual poetry’. Another form of ‘visual poetry’ that I’ve played with in my remix is the use of spacing, keyboard symbols & highlights of colour in the body text. This was something I experimented with a fair bit when I was a lot younger (like, 15) and it was fun to revisit this idea again here. I rarely write poems now and have always been an erratic poetry writer in any case but I do love the form, and experimenting with it. I went visual with this remix partly because I’m naturally drawn to visuals, but also because I don’t *actually* have the confidence to post an audio version (re my reference: ‘Not spoken’…). However, since hearing Cathleen Nardi’s audio remix (great hip hop interpretation! ), I’ve been thinking about audio a bit more. I’ve got an idea to do an audio remix of my poem using cuts from Kevin and Cathleen’s audio. I’m not sure if it would work or how it would sound but really intrigued to do the experiment. It could take a while though, so I’m just posting the visual version for now. And of course, I’m putting it out with an invitation (or challenge – interpret it as you like) to: >>> STEAL THIS POEM! What a beautiful rendering of the poem, side by side with the remix. I love what you have done here. It’s inspiring. The visual element changes the whole thing for me in interesting ways. Totally worth waiting for. That your 3 year old is part of the process is icing on the cake! Let’s get more people in the Arts & Crafts tent. Thanks to you both for your feedback – really appreciate it! You’ve both been big inspirations too – loving the creative undercurrent happening in rhizo14. Building on the creative energy. LOVE the idea of an Arts & Crafts tent – brilliant! Look forward to seeing you there! As promised, a reflection of sorts. Thanks Maureen! I just checked out your remixes and was bowled over by the reverb-book thief remix. Amazing. And excellently executed. Your simple poem was also lovely and really captured the playfulness of what we’re doing. I’m loving the creative undercurrent and the Arts & Crafts Tent concept is just brilliant! yes yes, copy! steal! be inspired! I downloaded an app called ‘kids doodle’ (an android app) but I’m sure there is something similar (or maybe even better..!) for the ipad. There seemed to be a lot of android drawing apps available. Fabulous Tanya!! I love what you and your three year old did ~ I am happy to have played a tiny little part in the inspiration for this. Yes to the arts and craft tent. Every so often I read a book and think ‘oooooo’ someone channeled my inner self, this is the book that I didn’t write. Austin Kleon’s book, Steal Like and Artist, did that for me. In so many ways his views reflect mine. I can hardly wait for Kleon’s new book, Show Your Work, 10 Ways to Share Your Creativity and Get Discovered (I think it will be right up our alley Tanya!). Hi Maureen, appreciate your feedback, and always find it interesting when inspiration hits and you find serendipitous connections that make it all come together. That was just what happened that morning so I had to mention it! wow those books sound great – will have to look them up and check them out – thanks for the recommendations! Wow, this was awesome tanya 🙂 and the artwork background is wonderful as well. Wow Tanya – inspired and inspiring! I stole that poem to use with my students – nowI have to steal your poem to show them what’s possible. Big whoops for the arts n crafts tent! aww thanks Sandra – really appreciate your comment and yeah – go right ahead and steal it – or better yet get them to steal it! ; ) using art to explore and play with ideas has been a great rhizo14 revelation for me.